I moved a few months ago and my new place was blessed with a dishwasher. At first I was over the moon. No more hand washing endless dishes after dinner parties! And then I began to wonder if a clean dishwasher detergent existed. Just like other cleaning products, dishwasher detergents aren't required to disclose comprehensive ingredient listings. This means it's nearly impossible to determine if a product is clean. Even Seventh Generation doesn't provide a full list. But luckily, there are some brands that believe in full disclosure. One of them is known as Better Life. They make household cleaners that vastly outpace the Clorox's in the cleaning aisle. I tried a couple different detergents before I found Better Life, and was unpleasantly surprised by the white spots on my silverware and glasses. Many green dishwasher gels use soap rather than detergent to clean your dishes. This means that if you have hard water, the minerals can leave deposits on your pretty glassware. Better Life solves this problem with their dishwasher detergent that is aptly called Automatic Magic. They incorporate my favorite detergents, coco glucoside and decyl glucoside, which (I can personally testify) prevent the little white spots. 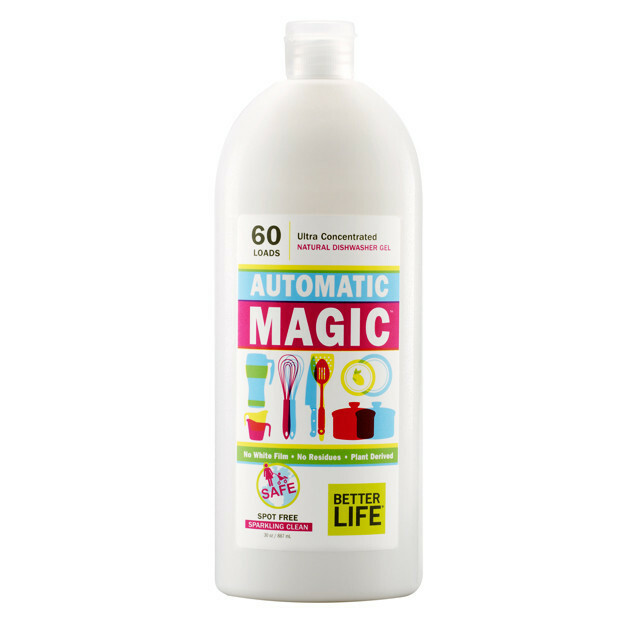 At $6.99 for 30 oz, Automatic Magic comes in line with the (very non-green) cleaning aisle basics like Cascade ($6.97 for 30.5 oz). And of course, it excludes the undesirables like sulfates, parabens, dyes, and fragrances. Go buy it at iherb at a discounted price of $5.99! And use my coupon code LGJ683. On your first order you'll get $10 off if you spend $40 or more, and if you spend less than $40, you will get $5 off! Ingredients in Better Life Automatic Magic Dishwasher Gel: Saponified vegetable oil, purified water, sodium citrate, decyl glucoside, sodium silicate, coco glucoside, sapindus mukurossi peel extract, glycerin, sodium carbonate, xanthan gum, sorbitan, natural enzymes, citric acid. I sought out this product and was not compensated monetarily or otherwise for this post. However, if you use my coupon code, I will gain credits that I can use to purchase products at iherb.com.